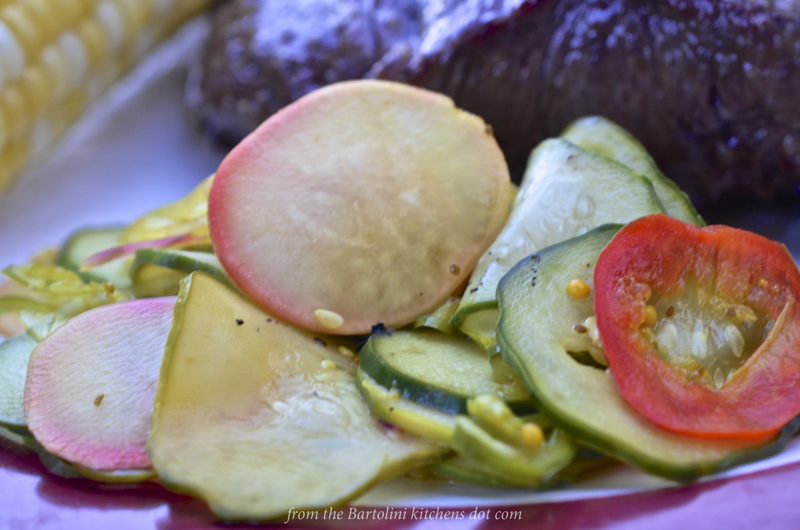 Several weeks ago, while walking around the farmers market, a bin of pickling cucumbers caught my eye. I bought some and on the way back to my car bought the rest of this recipe’s ingredients — well, almost. The three cherry bomb peppers came from my garden. They turned out to be the only cherry peppers that I’d harvest until well into autumn. My tomato plants, taking full advantage of their new flower bed and soil, grew to monstrous proportions, overcrowding everything else in the process. I have served this pickle atop every kind of sandwich imaginable, not to mention burgers, dogs, and wursts, too. I’ve also served it alongside a variety of grilled meats. For my tastes, a little something acidic on the plate is often a welcome accompaniment. If you prepare this recipe, the ingredients aren’t nearly as important as the pickling liquid. You can change the spices to suit your own tastes but If you’re going to make a smaller batch, just keep the amounts of vinegar, sugar, and water proportional to what I’ve listed. It couldn’t be easier and, since this isn’t being canned, you needn’t worry about whether the solution is acidic enough. So long as you use sterile jars & lids and clean utensils, it should last several weeks in your fridge. Place all of the pickling ingredients into a sauce pan and heat over a medium heat. Continue to simmer for 5 minutes after the salt and sugar have dissolved. Meanwhile, slice the remaining ingredients. Once cooled, combine the pickling liquid with the sliced vegetables, stir, fill jars, and cover. Refrigerate for a few hours or overnight before serving. Will keep in your fridge for several weeks, at least. Just be sure to use fresh, clean utensils when serving. For my tastes, this recipe is a little heavy on the cucumber. Next time I’ll cut the amount of cucumber and increase the other ingredients, especially the radishes. I’ll probably cut the turmeric, as well. As the pickle sat in the fridge, the turmeric gave everything the same hue, eliminating any color variation among all the ingredients save the cherry bomb peppers. The first photo was taken a few hours after I made the pickle. The second was taken one week later. I know, I know, Every year I bring you back to this recipe for giardiniera — and with good reason. 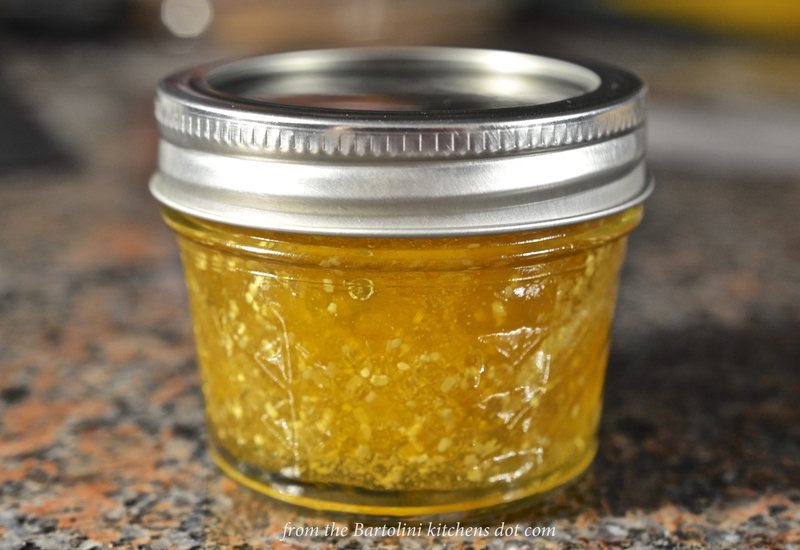 Next to the blueberry cheesecake ice cream recipe, this condiment is the most requested and savored by my taste testers. It really is that good. Best of all, it can made anytime because its ingredients are readily available year-round. You can learn all about it by clicking here HERE. This entry was posted in Condiments & Snacks, Gluten-Free, Vegetarian and tagged Cherry Bomb Peppers, Chillies, Cucumbers, Food, Italian, Onion, Radishes, Recipes by ChgoJohn. Bookmark the permalink. Thanks for stopping by and taking the time to comment. Will do. I was just thinking of pickling vegetables for my sandwiches. 😀 Thanks for sharing! I’ve never made pickles before and it looks really easy! Hope to give this a try soon, thanks for sharing the recipe! Hi John, you make it sound so easy. The photos look great as well. Apart from the color, what happened to the variety in flavor of the different vegetables? Or is it more a variety in textures that you’re after? I like some pickles like cucumber, but with others including bell peppers and sundried tomatoes, I prefer sott’oli without any vinegar as I don’t like how it affects the flavor. We had some amazing sott’oli in San Daniele (served with the local prosciutto), including artichokes. Does that ever sound good, Stefan. Hello, Dimple. Good to see you and I hope all is well. Our cucumbers will be ripening soon. I will need a few pickle recipes then. Perfect timing. Thanks. You’re very welcome, Glenda. I like this one because there’s no processing in boiling water, It’s so much easier this way and the vegetables retain their crunch. Ooh I love pickles but have so far not seen these little cucumbers in our seaside town 😦 Maybe it’s time to make pickled onions instead! Hope all is well with you. 0430 and that hamburger with the pickle sure looks delicious! New kitchen? Good for you! You’d have been very welcome. I’m not sure you’d have liked the pickle much though, it was quite a weird one! I like quick pickles, saving recipe. I will probably leave out the turmeric. I think you’re right, Norma, and next time I’ll leave it out altogether. Hi, Dave. Your pickling recipe for cherry bomb peppers is my go-to recipe, as you’ll soon see in an upcoming post. I won’t let summer pass without having at least a few jars of pickled cherry bombs on the shelf. Quick pickles are the best! Never seem to have time to do the traditional kind, but anything I can refrigerate I’m good with. Like that you use both cider vinegar and white vinegar — haven’t tried that combo, but I will. Good tip, too, on how important it is to maintain the water/vinegar/sugar if you change quantities — there’s good chemistry behind why this ratio is important. I just don’t know what it is! 🙂 Fun post — thanks. Pickling is the best! It’s such an interesting process to me, and delicious too! I agree, Mary, and I love the end-results. Dear John, it is as you said: the problem has been solved mysteriously. I’v got your today’s post! I’m included… 🙂 – Like your pictures, especially the first one, it’s so colourful and yummy! Nonetheless your recipe looks great and juicy and yummy. What I did not understand quite well is why the brine is to be discarded (with giardiniera). Aren’t there lots of healthy things dissolved in? Is that maybe why pickles are not comparable to fermented vegetables, where the brine may be is needed for the fermentation process? Whereas in the above recipe there’s no brine produced at all – that’s why they’re called “quick”, isn’t it? I’m glad you took the time to check out the giardiniera recipe, Irmi. That recipe is a favorite among my friends and they are eager for me to make it. Not only are the vegetables brined, but the liquid is oil-based and a pickle has no oil but relies upon vinegar. I’ve never thought to preserve the brining liquid but now yo have me thinking. I wonder what I could do with it. I’ll be bringing my turkey for Thanksgiving and I bet this brining liquid make the perfect base. Italian giardiniera is often treated as a salad while here in Chicago it is strictly a condiment, though I must admit I’ll often serve some on my plate because I do enjoy it. I serve this pickle with just about anything. Whether on top, as with a wurst or burger, or along side, as I did with grilled pork chops. It is called a fresh pickle because, once jarred, it is not boiled as one does in the canning process nor does one have to wait before serving it. Most fresh pickles can be served anytime after being prepared, though I prefer to wait a few hours. Thank you, John, for your kind reply! I want to give it a try – just have to do the purchases yet… – I love the Indian kitchen too. I try to make some recipes sometimes, I just leave out the salad and chutney thingies… 😉 And, of course, I do like to eat out at (/in?) an Indian restaurant…. We have a number of grocery stores that all feature pickle bins where these large suckers are swimming in their juices, waiting to be sliced up and gobbled down. That being said it is amazing how different they taste. I assume the amount of vinegar up or down is the decision-maker. In any event I will never turn down any slice of pickle I come across…regardless of how pickled they come across. I couldn’t agree more. Nothing like a good pickle, You may be right about the vinegar level affecting taste, though I’m sure the type has something to do with it as well. I’ll often use wine vinegar when pickling onions. I agree about the turmeric. It’s so overpowering. I usually keep it out. I do recommend adding thinly sliced celery stalks. I find it adds a lot and very tasty on its own. Yes, smaller is definitely better when it comes to vegetables and fruits. Some of the newer versions are so huge it’s scary! I should try to make pickles again. For some reason I don’t do well with them. That and brownies! Luckily my daughter has that recipe down! Yumm, I do love me some spicy pickles! And I like the idea of radishes and celery for that extra crunch factor. Great recipe! Thank you. It really was a good batch and both family and friends loved it. Nice and simple John. Very nice, I have to say. That’s what I love about the recipe, Conor. Quick and simple. No pots of boiling water and all that mess. Oh I do love a quickle! Haven’t heard of cherry bomb peppers, but what a fab name! We visited your beautiful country in April and I was totally amazed by the variety of peppers available (and hot sauces)! Love the sound of radishes in the mix. Pinning this to try it later, especially as my ten year old has now decided he loves pickles. I am so glad you waited until you’ve returned home before admitting that you love quickies. 🙂 I hope you enjoyed your time here, Saskia. Like your home, it’s a big country with much to see. The pickling liquid is a good one. You can switch the ingredients to suit your little man’s tastes. The best thing about it is that you can make it this afternoon and serve it with tonight’s supper. Love it! I hope you enjoyed the pickle, Saskia. If you travelled any stretch of Rte 66, I’m sure you had a great time. So many tourists come to see NYC or LA and maybe another city before heading home. Like Oz, there is so much more to this country. You were wise to travel that old highway. Haven’t made the pickle yet. Ran out of time for a ‘big shop’ last weekend. It’s on the list though. Drooling at the thought. Have to admit I am ‘entering’ this ‘discussion’ at the 101 level. Have never made any pickles and basically, being a typical North European, eat my Polish dills and pickled beetroot and c’est ca 🙂 ! Love your simple recipe even tho’ terms like ‘cherry bombs’ and ‘Melrose’ sweet ones are quite new! But have the idea and shall try. Meanwhile am wondering why I can’t get a doggerel about Peter Piper and his ‘peck off pickled peppers’ out of my head . . . 😀 !!! Over here, Eha, most people think of cucumbers when they hear the word “pickle” and there are a number of liquids to do it. Some are brined and others are vinegar based. Some pickles are preserved with their vegetables boiled in the canning process. Others, like mine today, are “fresh” and the vegetables aren’t cooked. You can pickle any vegetable. I’ve seen mushrooms,onions, peppers, radishes, you name it, pickled. If the vegetable is crisp, I prefer a fresh pickle to retain that crunch. Sometimes, boiling the jarred pickle will soften the vegetables, especially if they’re sliced. The trade-off is that fresh pickles will last a few weeks in the fridge where canned pickles will last a year on the pantry shelf. To clear any confusion, cherry bomb peppers are about as hot as a jalapeño. Melrose peppers aren’t at all spicy and are rather sweet. Due to the vinegar, this pickle and those that I favor are acidic, I love something a little acidic on my plate and serve this on or alongside many mains. If you do make this, I think you’ll be surprised how simple it is to make. If you’re at all like me, you’ll already be considering vegetables to include in the next batch. Great pickling liquid John!! 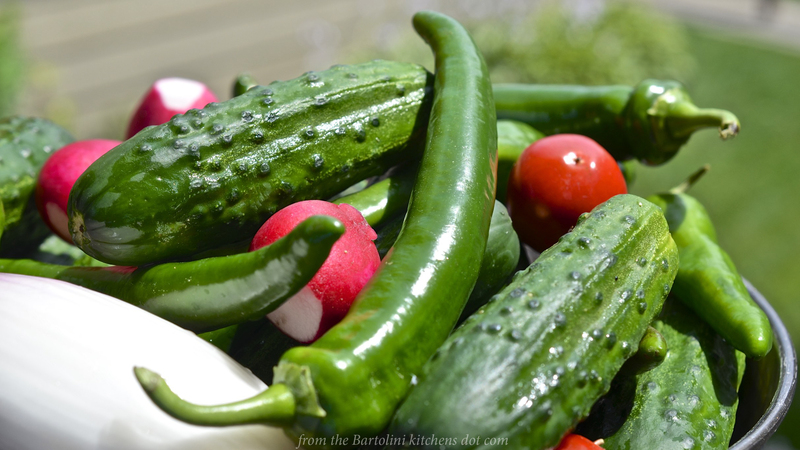 I make quick picked veggies quite often and love using different flavors. Definitely will be trying yours. Oh yea…sandwiches and sausage. YUM! I certainly hope you’ll share your list of ingredients when you do, MJ. I’d love to see what chiles you’ll use. What I love about a fresh pickle is that the spiciness of the chiles/peppers doesn’t really leach into the liquid like it does when canned. As a result, some bites are mild while another may have a bit of heat. That’s why I like shishito peppers. Totally agree John! I pickled some super hot chiles the other (a new hybrid) and thus far the pickling liquid doesn’t seem too hot. But then pickle guerro chile every year because I grow them, and the heat really leaks into the liquid. I love using the pickling liquid from the guerro in homemade mayo. 🙂 Have a wonderful Thanksgiving!!! I hope you, too, have a wonderful Thanksgiving, MJ. The G.O. adores pickled cucumbers, and I’m a fan as well with a slice of cheese on a biscuit. I could get the G.O. to do the slicing. Much safer. Congrats if he agrees to it, EllaDee. This recipe is such an easy one that the slicing is really the only hard part. By “hard” I mean time consuming. Once he tries it, I doubt you’ll have any problem asking him to do the slicing again. It really is a good pickle! I hope you like it, Roger. I keep a couple jars in my fridge at all times. Looks like a great recipe & since I was just explaining to my daughter that you could make pickles without having to go through the canning process, I’m going to share this with her. This is a good one to share, Diane. I’m sure she’ll like it, as do my friends and family. 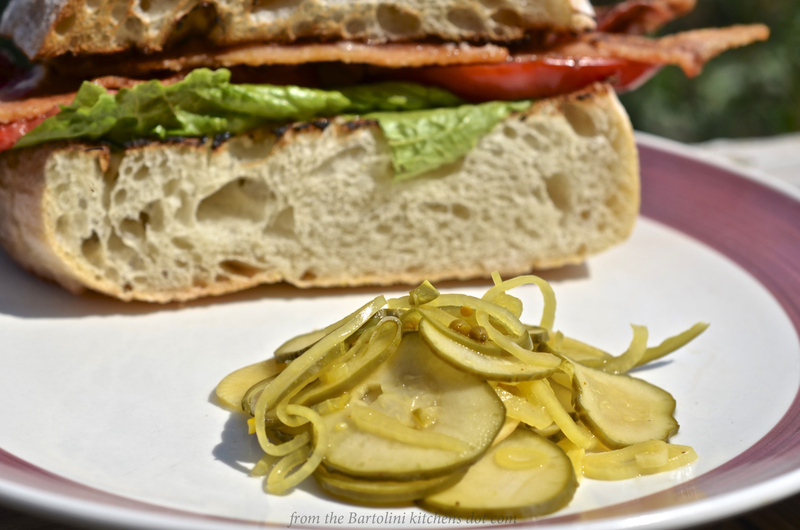 A few years ago, I posted a recipe for Refrigerator Bread and Butter Pickles. It’s another good one that needn’t be canned. You can see the recipe HERE. We didn’t get any cucumbers in the garden this year. The pickles look great and can’t wait to see the ground cherry jam. You are so correct, Ventis. We do “eat with our eyes” first. The turmeric, “curcuma”, ruined the beautiful colors and made them all very pale. Next time I won’t use it so that the colors will remain vibrant. Thak you for visiting, Ventis. It is always a delight to see your comments. But I am keen on this recipe, and it’s good to know that you can substitute different vegs, and make smaller amounts as long as the proportions remain the same. I LOVE vinegary things, and I can see myself making these quite a bit. Now, don’t laugh, but could a person do carrots this way? And, if so, would they have to be cooked somewhat before adding to the vinegar mixture? I know what you mean, Ruth.Pickles like this one are so much easier than the rigamarole needed for canning. When my preserving is in full swing, it seems like that big pot of boiling water is never off of my stovetop. The hardest thing about this pickle is the slicing and if you have a mandoline, well, it’s a snap. I hope you do try it and like it as much as I do. I adore a good home made pickle, which is far better than being in a pickle (oh dear, sorry about that). I used turmeric in an Indian carrot pickle recipe and found it really clouded the beautiful colour that pickled carrots get, so I’d either reduce or remove entirely. I am quite jealous of your bumper crop of tomatoes, although I haven’t grown tomatoes for a few years, our dear neighbours did and we were always the grateful recipients of over production, except this year. Apparently the squirrels ate more than their fair share last year so this year they didn’t grow any. That’s not just bad for the squirrels, it’s bad for us too. I’ve since made another batch and lessened the turmeric but still the vegetables were discolored. I think I’ll drop it altogether next time. It looks so good when first made, like in that first picture, and it’s such a disappointment a week later. I’m having pickle cravings now! I would totally see these pretty colours on a cheese platter or with some cured meats. My aim is to try to make them before the end of the year. I’m with you – anything acidic is absolutely welcome on my plate. I’ve never pickled anything, but my mom used to all the time. I might have to change that one of these days. The kids would love it. You should see them devour pickles! I think you’ll really like this one, Kristy. It’s very popular around here. Do you like bread and butter pickles? I posted a recipe for them, too, and it doesn’t need to be canned — unless you want to. Both of these recipes are really easy to follow and the results are great. When you get some time (Ha! ), give ’em a try. I definitely need to get into pickle-making, and a quick pickle like this would be a great place to start. There’s something about the vinegar solution simmering on the stove that’s just so nostalgic (Mom used to make pickles), not to mention gloriously sinus-clearing, lol. Seriously, your pickling liquid sounds delicious! Hello, Melani! So nice to hear from you. I am just now getting things caught up and will be making the rounds again.